Ram Chandra Shah - Websoft IT Nepal Pvt. Ltd.
Hi This is me Ram Chandra Shah from Saptari Saptari koshi nepal. 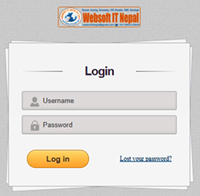 I have studied Webpage Designing & Development from Websoft IT Nepal Pvt. Ltd. My Registration no is 160857/52. my contact mobile no. is 9805364480. My parent's name is Dambar Shah.I was completed Diploma In Computer Engineering while joining here. Thank You.